I have a confession to make: I kind of hate the trend of hyper-improvisation in film comedy. Don't get me wrong, there are plenty of modern comedies I very much enjoy, and a handful of filmmakers (like Edgar Wright and Wes Anderson) who can still innovate with staging, editing, and set-design, but for the most part, modern comedies feel like variations on 'crowd work' stand-up sets, but where the comedian riffs on another actor in front of them rather than on a crowd in general. It barely uses the mechanics of filmmaking at all, at this point, and the raw physicality of classic comedies by folks like Charlie Chaplin and Jacques Tati seems like a bit of a lost art. Or, I would have considered it a lost art before I saw Lost In Paris, the new film from husband-wife writing/directing/starring team Fiona Gordon and Dominique Abel. Gordon and Abel go full Tati in what is almost certainly the year's funniest, most charming comedy. Fiona (Fiona Gordon) has lived in Canada all her life. She has dreamed of going to France ever since she was a little girl, when her beloved Aunt Martha (Emmanuelle Riva) left for Paris, but she stayed in her sleepy town as the head of its minuscule local library... until a letter from her now-93-year-old aunt beckons her to Paris, to save her from being forced into a nursing home. There, she meets Dominique (Dominique Abel), a homeless man wandering the streets of Paris looking for his next meal, and the two reluctantly join forces to search for Martha, who has run away to escape her nurse just as Fiona has arrived. It's a simple set-up, but it's one that gives Gordon and Abel ample opportunities to set up inspired visual gags. Some are updated Chaplin, like the booming speaker in a restaurant that prompts any patrons its pointed at to bounce along to the bass line without comment; others recall Safety Last, like a hilarious near-death ladder incident atop the Eiffel Tower. But the overriding inspiration, to me, feels like Tati, with the controlled environments crafting a space for fantastic - and something preposterous - comedic setpieces. Lost In Paris is slight, an 83-minute dessert, but it is laser-focused on making sure that every second is setting up or paying off a visual gag. What really sells it all, to me, is innocence of the three leads. It fits for Fiona's wide-eyed tourist, though her hyper-exaggerated doe-eyed optimism is clearly a broad comedic device, making her clumsy grace feel earnest and fun rather than calculated. Emmanuelle Riva is one of France's great talents, and she has no trouble whatsoever selling her character's earnest confusion and sense of adventure as she explores the streets outside her apartment for seemingly the first time in years. But it is Dominique who sells the film's silent vibe the best, his charismatic homeless man conveying simultaneously the wide-eyed everyman befuddlement of Chaplin's Little Tramp with a cannier, calculating edge that grounds him in modern France. Classic slapstick performers had the ability to convey earnest naivete without seeming fake, but that's harder than it seems -- just look at Channing Tatum's song-and-dance performance in Hail, Caesar! to see how easy it is to overcompensate just a bit too much and dip into smarm. Gordon, Abel, and Riva have no such issue, and it helps hold them together even at the film's most ridiculous moments. Together, the three have an irrepressible chemistry that keeps the movie afloat even as a handful of jokes go on a bit longer than they should. Combine the three excellent central performances with sharp direction, inspired visual gags, and a sweet, simple story, and you have a genuine winner, the kind of retro delight that is both slight and almost assured to charm film fans and newcomers alike. Lost In Paris is slight, but it never overstays its welcome and it remains enchanting from start to finish. Fiona Gordon and Dominique Abel, who previously wrote, directed, and starred in The Fairy and Rumba, have a film here that could be a legitimately breakout hit, a revised and updated take on a lost classic genre of film. I know I'll be seeking out more of their work, at least, as I've rarely had as much fun at a film fest. Lost in Paris is playing at the Cleveland International Film Festival. 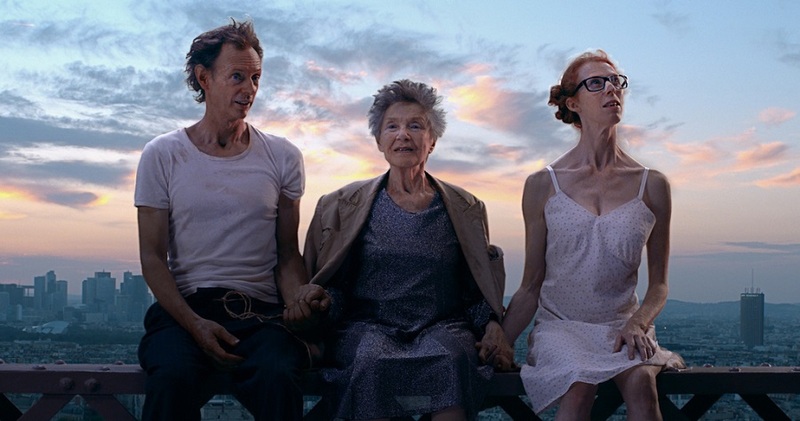 Lost In Paris was written and directed by Fiona Gordon and Dominique Abel, and stars Gordon and Abel with Emmanuelle Riva.